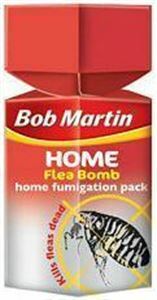 Bob Martin Flea Bomb Is A Convenient And Easy Way To Kill Fleas In Your Home, Especially In The Rooms Your Pet Has Access To. Warm Rooms Provide A Haven For Fleas Which Jump From Your Pet Onto Carpets And Soft Furnishings. One Flea Bomb Will Treat A Room Up To 36M3, Killing Fleas Dead.